If you’re like most homeowners in Hampton Roads, you probably forget that your back yard even exists between November and March. Barring the occasionally unseasonably warm day, all that real estate goes unused when it’s cold outside. But what if there were a way to get more use out of your back yard in the fall, winter, and early spring? There is: a fire pit. While a fire pit can provide a social (or solitary, if that’s more your style) gathering point year-round, it really proves its worth in colder weather. It’s a great place to warm up while playing outdoors in seven inches of unexpected snow or to have a few drinks with friends before the game on a Sunday afternoon. Because it provides both heat and light, it can be used at night or during the day. There are a variety of sizes and styles to fit any space and budget, ranging from smaller, portable fire fixtures to custom-built outdoor fire shoppes with built-in seating and other features. Do you want something portable? 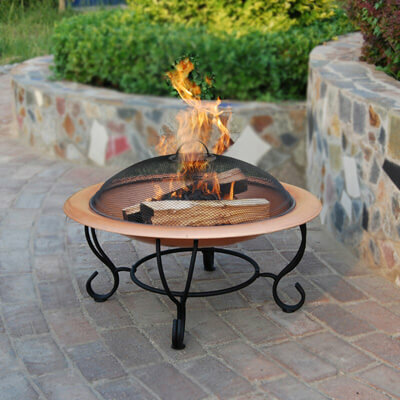 If you’re renting or planning to move soon, you may want a fire pit that you can take with you to your next home. If you’re comfortably settled and not planning on moving anytime in the near future, a custom install might be better suited to your needs. Where are you going to put it? Some communities require that fire fixtures be a certain distance away from buildings, overhanging branches, or neighbors’ homes. Check to see if there are any limitations on size or installation for your community. What will you set it on? It can be hazardous to put a fire pit on a wooden deck because sparks or embers could fly out and create a hazard. You’ll need a stone, concrete, brick, slate, or gravel surface for your fire pit. We can help with planning and surfaces – feel free to ask us questions! Wood or gas? Both old-school firewood and newer gas logs have pros and cons. Take scent, temperature, convenience, and availability of firewood into account before making your choice. Can’t decide? Ask us about dual-fuel options. What style? Both installed and portable options come in a variety of styles and materials. Fire bowls and tables are some of the most popular options and allow for eye contact between people seated around the fixture, but a chimney-type fixture might be a better fit for your space. A fire pit is a great way to get increased mileage out of your back yard all year long, and there are options for all spaces and budgets. Stop by one of our five convenient locations today – we’ll help you find the perfect outdoor fire fixture to suit your needs.